Grace oversees the social media channels for Creative Assembly’s 18-year-old award-winning franchise, Total War. She’s been working in the industry for the last 3 years and was recently named as MCV’s 30 Under 30 and was a finalist in the 2017 Women in Game Awards. 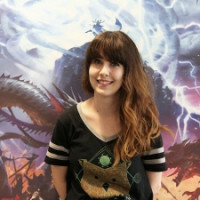 She works to promote the Total War: WARHAMMER series as well as the historical titles, cultivating a strong community tone of voice and drawing on strategic engagement through her love of puns and memes. As a social media manager for a community of almost half a million on Facebook alone, Grace Carroll is used to dealing with passionate fans. This talk will cover a number of key points for anyone interested in managing online game communities - dealing with negative sentiment, growing a community and above all, keeping the fans informed and excited without giving everything away. This talk covers the important basic knowledge of online community management and some tips and tricks to finding the voice of your game.